A few years ago, the only way to disable proprietary and inbuilt apps on an Android phone was by rooting it to gain full access to the system. Samsung devices remain easy to root to this day, but it is no longer recommended to do so as rooting a Samsung device trips its warranty, and not to mention rooting can also be a risky business in general. So how do you go about disabling apps and services that you don’t wish to use, yet are impossible to disable? Well, thankfully, there are a couple of apps that let you disable any app or service on a Samsung device without the need for root access. There may be more, but the ones we are aware of are Package Disabler and Adhell. Both apps list out all the apps and services installed on the device and let you disable or enable them with a single tap. 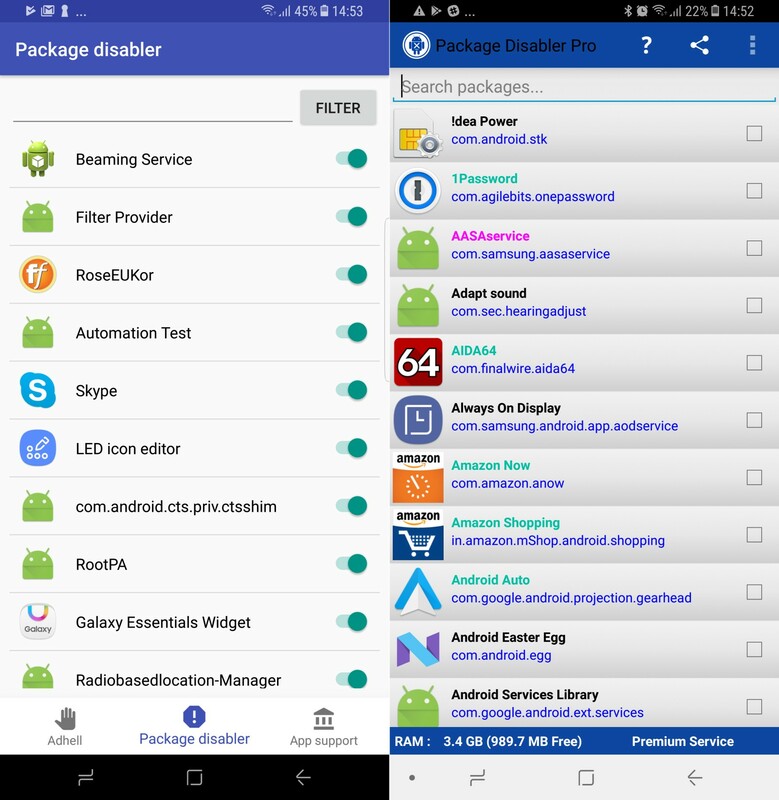 Adhell is free while Package Disabler costs a little over $1, and while both work equally well, Package Disabler is considerably more advanced (like letting you disable all bloatware at once) and offers detailed information on each app and service. Many of you probably know about these apps already as they have been available for some time, but we thought it would be a good idea to let our readers know that those unnecessary apps on their Samsung phone or tablet can be disabled without the need for root. So, you know, you can get rid of Bixby so that it doesn’t keep launching with each accidental press of the Bixby button (too bad the button itself can’t be removed, but hey, you can’t get everything in life, right?). Just be sure you don’t get carried away with disabling everything you see, as disabling some apps or services could have adverse effects on the operation of your device. Grab Adhell or Package Disabler from Google Play here or here. Package disablers are a great tool, just be careful – they can REALLY mess your system when you are not using them right. In my experience, the best battery life I achieved was without using package disablers. Bloatware apps can be disabled without these special tools (like Facebook, S-Voice, Peel remote etc. ), and there is no danger of disabling some needed package. If you know what you’re doing though, use them! I have used disabler pro since it’s inception along with greenify pro , green dosen’t dissable but what it dose do is to shut them down when not in use and prevents them from running in the background which saves big time on battery I’m consistenly getting about 4 day’s per charge with roughly 2-1/2 hrs of on screen time…. have posted many times on this site recommending the two combo as a download for sammy and a way to get rid of allllll the bloat. Adhell is free and blocks Bixby. That’s perfect! It is different disabling apps on setting, application? Yes, with that apps you can disable apps that can’t stopped..
Keep in mind when you have a Samsung Gear VR to enable Facebook when you want to update your Oculus software, as it relies on enabled Facebook. You can disable it again after updating. I am using Package Disabler too. Package Disable is a great great app! !